For most parents, buying your kid a regular gas-powered motor bike comes with its own challenges. First, gas-powered motor bikes can be too fast and dangerous to the rider, bystanders, and other road users. Secondly, it can be too noisy, which means trouble with the neighbours. Lastly, it’s very expensive, and even when you can afford it, you will still have to wait until your kid attains the legal age to ride. 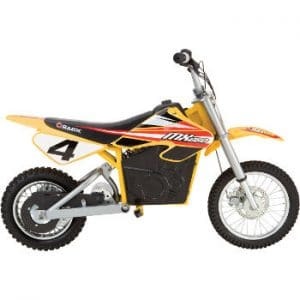 Lets look at another option with our Best Electric Dirt Bike for Kids Razor MX650 Rocket Review. This is why Razor MX650 is a perfectly reasonable alternative because you will not experience any of the above-mentioned challenges. It’s however still as enjoyable and fun as a regular bike, but much safer for your kid. They will still be able to perform flips and stunts, and explore lots of epic off-road exciting adventures. The Razor Rocket MX650 is a high-performance electric bike designed to hit dirt hard and fast. It features a variable speed, chain-driven motor, dual suspension and oversized pneumatic tires built for true off-road riding. A great choice for a young beginner. All the motocross experience without the need for a gas powered engine. The Razor Rocket will give a young rider a safer alternative than a gas powered engines. With limited speed and many safety features. The nature of electric power is lots of torque so keep in mind the Razor Rocket has massive acceleration that can get away from you if you are not careful. So instead of keeping your kids waiting for a gas powered motor bike until they are eligible to ride one, how about starting them of with a true biking experience in the meantime by buying them the Razor Rocket Electric MX65? The Razor Rocket MX65 comes with plenty of features that any avid biker will appreciate. The recommended age for riding on the Razor MX650 is 16 and above, with a weight limit of 220-pounds. However, some surveys have indicated that kids as young as 10 years with some biking experience can comfortably handle this bike. So if you are buying it for your younger child, this is good news; because the sooner you buy it, the longer they will enjoy using it. Motor: The Razor MX650 comes with a powerful 650 watt, chain driven electric motor that forms the core of the bike. The motor is powerful yet quiet to let your kids play without disturbing your neighbours. It generates more power to cruise through off-road conditions and uphill rides. Disc Brakes: With speeds of up to 17mph, you need an effective braking mechanism to stay safe and in control. This is why disc brakes are used both in the rear and the front which is hand-driven and powerful enough to bring the bike to a complete stop safely and steadily. Speed: The MX650 can safely attain a top speed of 15 –17 mph and you can control how first you wish to go by twisting the throttle on the right handlebar. Tires: The front has a large 16-inch tire while the rear has a 14-inch pneumatic tire, both of which provide the suspension you need for a great ride. The tires might be pneumatic but they are quite hard and can handle rough terrains with excellent power transfer. The knobby tire surface is to provide grip required to remain steady on bumpy and uneven terrains. Powerful: The bike was designed to handle a weight capacity of up to 220 pounds, and with a 650-watt electric motor, it’s powerful enough for conventional dirt biking and extreme off-road situations. Remember when I mentioned that it can be handled by even 10-year-old kids? Well, they need to be experienced bikers because this can be a too powerful for younger inexperienced riders. Steel Frame: The MX650 is built around a strong and durable still frame to ensure that it can withstand bumps and jumps that a typical dirt bike has to deal with. All other features are sturdy and properly secured too. Battery: The bike runs on three 12 volt sealed lead acid rechargeable batteries that take about 8 hours to recharge. This is fairly average but good enough for daily commutes. A single charge will give about 40 minutes of uninterrupted biking and fun. If you feel the charging time is a little longer, you can treat your kid with an extra battery if they have been exceptionally good. Minimal assembly: Unlike most shipped electric bikes, the Razor MX650 comes almost fully assembled; you only need to fix the front wheels and fix the handlebars. The assembly is however very intuitive and takes less than 10 minutes to complete. The assembly tools are also provided in the box. The tires come pre-inflated too, so you can jump on it as soon as charging is complete. Without a doubt, MX650 is definitely a much safer alternative to the gas-powered bike. And if you are wondering if it’s safe for kids, relax; it’s an electric bike. There is nothing combustible that can cause fumes or fire, and the only notable electric component is the rechargeable battery pack which is only 36 volt. And don’t worry about over speeding either. As earlier mentioned, the MX650 can only do a maximum speed 17 mph which is safe for kids with reasonable biking experience. The bike’s features are also securely fixed and sturdy so you don’t have to worry about breaking or unlatching anything while on the move. The pneumatic tires and dual suspension also add to the stability of the bike on uneven surfaces. The bike is also equipped with shatterproof fairings and fenders meaning there are no picking little pieces of plastic out of your kid’s arm while tendering to their bruises. On top of that, the powerful disc brakes will instantly bring the bike a stop safely. Solid steel construction fitted with high-quality fenders and shatter-proof fairings to take enough abuse. The pneumatic tires and dual suspension will let you have all the wind-whipping thrills and the dirt-kicking excitement of a classic Motocross motorcycle both off road and on paved surfaces. It meets all the safety standards and requirements for kids 10 years and above. It’s a bit heavy, (almost 100 pounds) and it can be cumbersome for younger riders to handle. The knobby tires do a great job on dirt and grass tracks but do not handle well the paved roads. Suspension is a little weak for rough terrain with jumps. If you are looking for all the dirt-kicking excitement and wind-whipping thrills of classic Motocross motorcycle scaled down to the size and safety a 16 year old, then the MX650 is what you need. The Razor MX650 is a great electric bike that will give your kids the thrill and fun but without the dangers associated with over speeding and aggressive riding. SAY YEAH Electric Dirt Bike. This 24 Volt, 500 watt mini dirt bike is a scaled down, battery-powered electric motocross dirt bike for off-road riding. designed for 13 year old and up. Top speed 15 mph. Available at Amazon. Razor Rocket MX400. 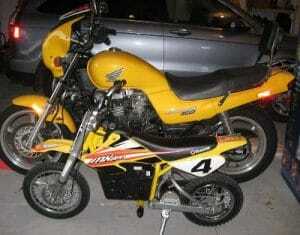 This bike weighs a full 36 lbs less the Razor Rocket MX650, costs $100 less and has a top speed of 14 mph. If you have a small child this bike maybe the safer option. Available at Amazon. Razor RSF650 Electric Powered Street Bike is a another excellent Razor electric dirt bike 650 watt high-torque, chain-driven motor on a steel trellis-frame chassis design. Available at Amazon.